Which is the heavy end? Officer Lloyd Riegel of the State Police attempts to ascertain the balance of a 30-30 Winchester Carbine while testifying as state’s witness in the first degree murder trial of Casper A. Oveross Tuesday. 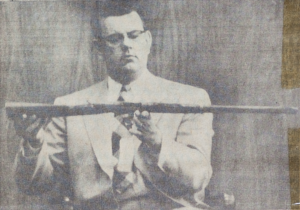 Riegel made the tests on the stand after Defense Attorney Bruce Williams asked him on cross-examination which end of the rifle he though was the heavier. The rifle which the state claims is the murder weapon in the Ervin Kaser case was reportedly found muzzle down in the mud of the Pudding River near Pratum. Riegel decided the muzzle end was heaviest.